Easter-Christians' Festival of Resurrection of Jesus, Easter, About Easter. 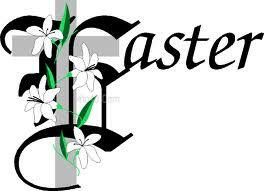 Easter is celebrated by the Christian community all over India and abroad with great enthusiasm. Easter is a festival of joy and happiness as Resurrection of Jesus is celebrated with much gaity. Easter cakes and Easter eggs are popular and made in each Christian home. The flowers, garlands, candles and electrical illuminations add colour and brightness to Easters festive environment. Jesus, the son of God was baptised by John, the baptist and the Spirit came upon him and led him into a desert, where he spent 40 days and 40 nights and he was very hungry. On the fortieth day, the Satan appeared before him and tempted him thrice. He told him to change the stones into bread as he was the Son of God. Having failed, the devil further tempted Jesus by asking him to throw himself from the highest point of the temple. Lastly, Jesus was asked to worship the Satan. Jesus rebuked the Satan and told him to get away. Later, Jesus preached, addressing the people from the hilltop and explaining to them how to attain true happiness. The teachings are called, `The Sermon on the Mount`. Afterwards, Jesus had supper for the last time on this earth with his disciples. Before the last supper he washed the feet of all the disciples and told them to live like brothers and to love one another. He revealed to them how one of his disciples would betray him soon. This is called the `Last Supper`. After the last supper, Jesus went to the garden called Garden of Gethsemane to pray. He was very sorrowful, filled with stress and grief. He was pained and nervous as he knew how much sufferings he would have to soon endure. Jesus prayed to the Father Almighty to take away the cup of sufferings from him, if possible. He also said that not His but the Father`s will be fulfilled. Soon Jesus got arrested and crucification was ordered to him. Jesus had to walk laden with the wooden cross towards the hillock called Calvary, where he would be crucified. There are 14 stations on His path to Mount Calvary where He suffered much. These 14 stations are called the Way of the Cross. Jesus was crucified on Friday and was laid in a tomb. He was raised from the death on Sunday at dawn - three days after his death. An Angel came and explained it to His mother that Jesus is risen from the death and that he had been given authority over heaven and earth. Jesus made appearance to his mother and she was delighted to see Him. Christians believe that death can cause only temporary departure and a day will come when there will be reunion and ressurection and the dead who have lived a good christian life will be raised from the grave. It is celebrated in remembrance of the events through which Jesus, the son of God had to pass. For the Christians the season of Lent is a period of prayers, fasting and abstinance. In the day-to-day life the devil acts busily and cunningly using our near and dear ones, our most loved ones and much careless ones who are weaker in prayers or spiritually weak. The Satan makes them a victim, using them to carry out his nasty and devilish designs to harm us. So, in this period of Lent, all Christians are prayful so that God may grant them strength to win over the Satan. The season of Lent continues for 40 days and nights during which the Christians remind themselves how Jesus was mocked and tempted by the devil in the desert. They pray especially to overcome such temptations which may lead them away from God. Ash Wednesday marks the beginning of the season of Lent. It is a wednesday when all Christian faithfuls go to church and attend mass. During the mass the priest puts a little ash on the forehead of the faithfuls and reminds them that the body is made of dust and at the end of ones` life the body will return to dust. Ash Wednesday emphasises that human beings are the salt of the world. If salt loses its savour it is worth nothing. Christians are reminded that they being human is not enough but have to retain the goodness in spirit and be a light which can be of help to others or set example for others. It is expected that one should be like a light to brighten the world around them. Maundy Thursday is a day when Christians remember how Jesus, the son of God went to pray in the garden called Garden of Gethsemane. Jesus was filled with agony, grief, stress and sorrow as he knew that he would have to endure much suffering, pain and condemnation before being crucified. Maundy Thursday is remembered for the Last Supper that Jesus had with His disciples. A mass is offered with devotion and the priest in his sermon reminds the community people to love all men like brothers as that was what Jesus had preached on Earth. Before Maundy Thursday the graves and the Cemetery is cleaned, the gardener cuts/trims the overgrown shrubs and bushes and white washes the graves. Sentencing Jesus to death by crucification. Accepting of the wooden Cross by Jesus. Tired and weakened, Jesus falls to the ground under the weight of the cross for the first time. Meeting of Jesus with the grief stricken mother. Simon helping Jesus to carry the heavy Cross. Wiping of the bleeding and sweating face of Jesus by Veronica. Falling of Jesus for the 2nd time under the weight of the Cross. Jesus consoling the women who could not see his sufferings and were crying. Falling of Jesus for the 3rd time due to weakness and continuous lashing by the soldiers. Reaching the destination and stripping of the clothes of Jesus. Thereby, re-opening of the wounds resulting in heavy bleeding. Nailing of Jesus` hands and feet onto the Cross. Suffering and agony of Jesus for 3 hours on the Cross and then bowing his head and surrendering His spirit to His Father Almighty. Jesus died on the Cross at 3pm (15 Hrs). Bringing down the Lifeless body of Jesus from the cross and laying it onto the arms of His mother Mary. Wrapping of the body of Jesus in a shroud and laying it in a tomb which was sealed by a stone and was guarded. God sacrified His son Jesus, on the Cross because He loved the people and wanted to prevent them from following the devil. The festival of Easter is celebrated by the Christians with much gaiety and happiness. Everyone greets one another. Masses are offered with devotion and there is festive environment everywhere. The people gather flowers, garlands, make or buy wreaths of flowers and Crosses. Candles are bought. Flowers and candles are lighted on the graves of the beloved family members. The Cemetery is lighted with electrical decorative illuminations. Hymns are sung, prayers are offered. This resurrection day is celebrated with much cheer. The masses are offered early in the morning from 4 am. There are mid-night masses too. There are masses being offered at various time, 5.30 am, 6.30 am, 7.30 or 8 am. 10 am 12 am and also evening masses are held for the convenience of the community. On the pre-easter evenings there is much excitement at home as the elders of the family prepare Easter Cakes, Easter Eggs, other snacks and no one is in the mood to sleep till late night. On Easter Day family reunions take place and there is laughter in the atmosphere. The smell of delicious meals that the elder family members make, adds to he excitement of the festival of resurrection. If there are bigger family reunions the cook is made to prepare the food and everyone makes merry. The Easter Day is a day of happiness when we all are happy as we hope to meet our beloved family members, our dear friends and relatives who departed from us due to death.